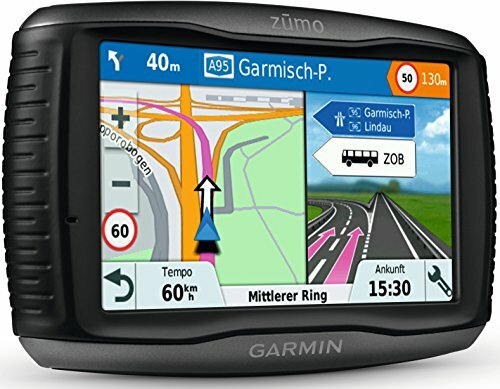 Garmin Zumo 395LM and 595LM motorcycle GPS navigators offer exciting, adventurous routings for those twisty, hilly, terrain-hugging roads -plus glove-friendly, sunlight-readable displays, lifetime maps, onscreen music control for compatible MP3 players or smartphones (add streaming from Pandora and Spotify with the 595LM) and rider alerts when approaching sharp curves, animal crossings or nearby red light and speed cameras. Bluetooth lets you make and receive calls while your hands stay on the handlebars. Plus, the 595LM model adds an impressive 5-inch display and Live Track feature, which allows friends to track your current location. It also displays smart notifications such as text messages to help keep you in touch on the road. With its rugged design, Zumo withstands fuel vapors, UV rays, rain and other harsh weather elements.